Learn how to make a fruit bouquet, the easy way! This vibrant dragon fruit recipe only takes 25 minutes to make using 5 ingredients: white-flesh dragon fruit, green grapes, strawberries, kale, and cabbage. Perfect for Valentine’s day, mother’s day or even as wedding centerpieces. WATCH MY RECIPE VIDEO below to see why it’s so simple to build. Next time, before you give flowers, try making this DIY fruit bouquet at home! Dragon fruit is like a tasteless kiwi. It has a firmer consistency than a kiwi, but it has more seeds. If it’s a bit ripe, the white-flesh tastes slightly sweet. You might be wondering why I chose a tasteless fruit to make a fruit bouquet. Well, we also eat with our eyes. The deep pink skin beautifully contrasts the white-flesh center. Then there are the black seeds speckled throughout the white flesh. I think it’s a vibrant color combination that looks stunning in a bouquet. 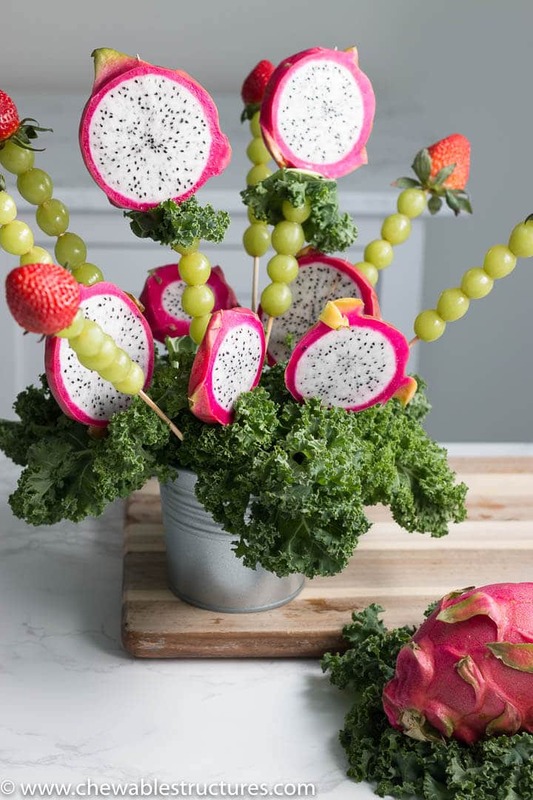 Plus, the dragon fruit skewer is adorned with green grapes and garnished with curly kale. Carve the cabbage so that it is roughly one third the volume of the vase that you’re using and place it inside the vase. You can jab the skewers into the cabbage. This will allow you to arrange the skewers anyway you like! The first time I made this fruit flower bouquet at home, my curly kale dried out and was more limp than curly. Instead of throwing it out, I brought it back to life. The trick? I popped it into a big bowl of water and it sprung back to life in 15 minutes. Just remember to dry off the kale before you add it the fruit bouquet. Since there are various types of kale, don’t worry if you get confused. This kale guide will help you spot curly kale at the grocery store. If curly kale is unavailable, red kale works too! The best way to keep the dragon fruit on the skewer is to make sure your dragon fruit slices are at least ½” thick round slices. You want ½” thick slices so that the skewer is nicely hidden in the flesh of the dragon fruit. Also, cutting round slices will help the skewer securely poke through both ends of the skin. There’s no structural reason for this. I just think it looks prettier with the stem! It’s important to make fruit skewers of different heights so that the bouquet looks really full with lots of depth. 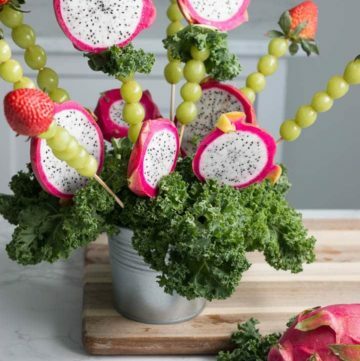 The best way to prepare this DIY fruit bouquet in advance is to wash all the fruits, dry them off completely, and then assemble the skewers. Then, put skewers on a baking sheet, cover it with plastic wrap, and store in the fridge up to one day in advance. You can also precut the cabbage base and remove the kale stems. If you go this route, it’s best to soak the curly kale in a big bowl of water so it’s nicely hydrated. This will prevent the kale from drying out the next day when you assemble the fresh fruit bouquet. But, make sure to use paper towel or a hand towel to remove all the extra moisture before you store it in the fridge. If you assemble the entire fruit bouquet and store it the fridge, you will need a lot of space. I mean, a lot! My final fruit bouquet was roughly 20” in diameter and 18” in height. 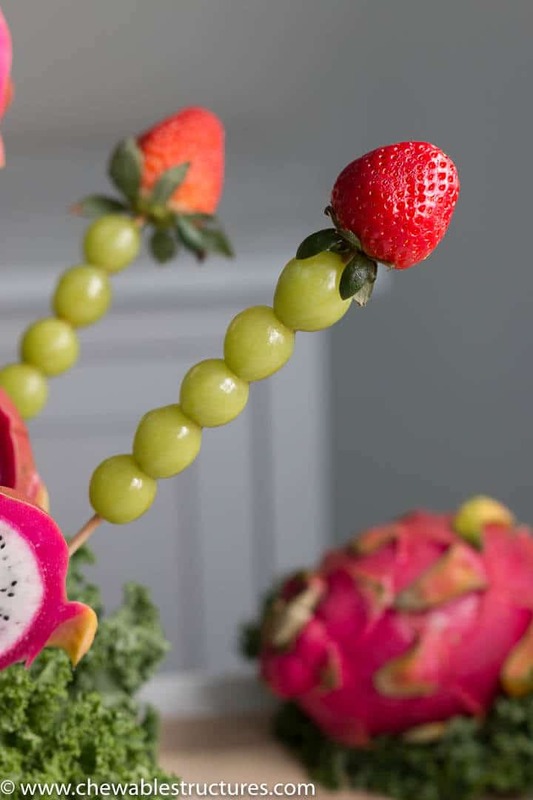 This dragon fruit bouquet is perfect as a Mother’s Day fruit bouquet, Valentine’s Day gift, and more. Let me know what you think in the comments below. Learn how to make a fruit bouquet, the easy way! 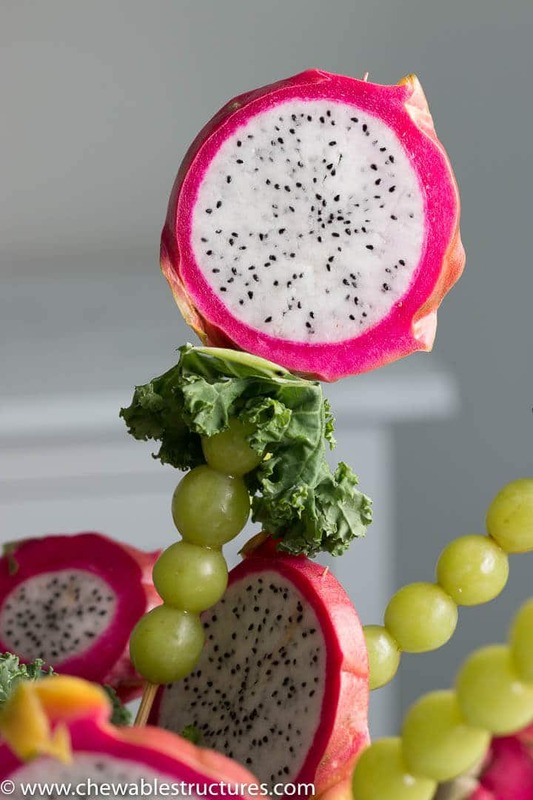 This vibrant dragon fruit recipe only takes 25 minutes to make using 5 ingredients: white-flesh dragon fruit, green grapes, strawberries, kale, and cabbage. Perfect for Valentine’s day, mother’s day or even as wedding centrepieces. Wash and dry all of the ingredients. Cut the dragon fruit into 0.5” thick round slices. Prepare the cabbage base. (Note: This is the base that the fruit skewers will stick into). Cut the cabbage so it fills 1/3 the volume of a 4.5” dia x 4.25” tall vase. Place the cabbage in the vase. 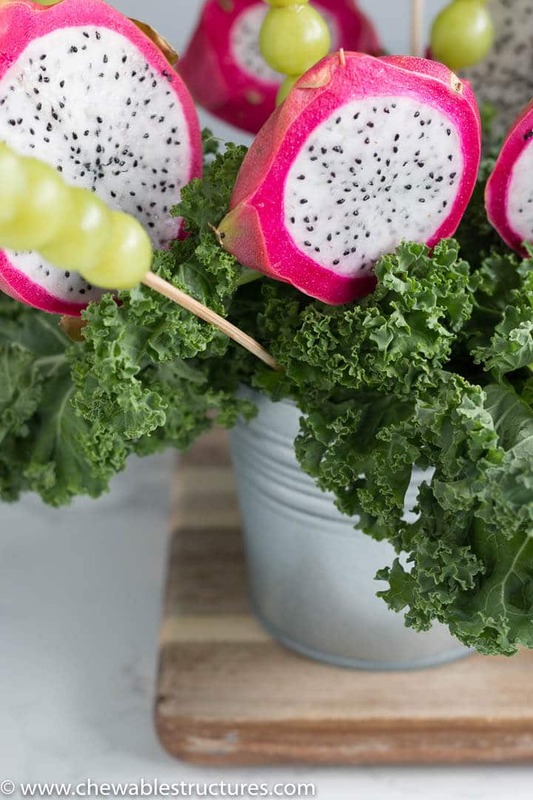 Prepare the kale garnish for the dragon fruit skewers. Remove the stem of 4 leaves. Rip up the leaves so they’re roughly 2” x 4” strips. Set aside. (Note: This doesn’t have to be perfect). Prepare the kale for filler in the bouquet. Keep the stem on the remaining kale leaves and set a side. (If your kale looks dried out and limp, see notes below). For the 14” long dragon fruit skewers, add 5 green grapes to a 14” bamboo skewer. Fold the 2” x 4” kale leaves, then add it to the skewer. (Note: the green grapes will prevent the kale from sliding down the skewer). Add the dragon fruit slice. (Note: make sure the skewer pierces the bottom and topside of the skin, otherwise the dragon fruit will fall off). Make 2 in total. For the 10” long dragon fruit skewers, repeat the same instructions for the 14” long dragon fruit skewers, except only use 1 green grape. Make 5 in total. For the strawberry skewer, add 5 green grapes then a strawberry to a 14” bamboo skewer. Make 6 in total. To assemble the fruit bouquet, centre the two 14” long dragon fruit skewers in the middle of the cabbage. Add the five 10” long dragon fruit skewers forming a circle around the 14” long dragon fruit skewers. Add the six strawberry skewers in-between the five 10” long dragon fruit skewers. Fill in the outer gaps of the bouquet with the remaining kale leaves (with stems attached). 1. For the full list of tools, check out my blog post. 2. For ease, you can prepare the fruit skewers the day before, then assemble the bouquet the day of. Remember to store the fruit skewers in an air tonight container or cover them with plastic wrap. 3. If the kale dries out and looks limp, soak it in a bowl of water for 15 minutes. Make sure to cover the entire kale and it will spring back to life. 4. Since there are various types of kale, this kale guide will help you spot curly kale at the grocery store. If curly kale is unavailable, red kale works too!